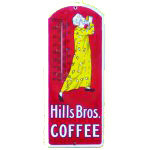 Thermometers, like clocks were a popular advertising item because the face has room for a nice logo or tagline, and thermometers get mounted on a wall where people would look often, whether at a gas station, grocery store, or drug store. 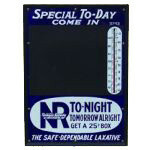 Especially before TV news and cell phones, a wall-mounted thermometer was a person’s best idea how hot or cold it was at the time. 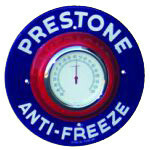 There are two main types of thermometers, the round bodied type with an indicator that moves based on the temperature, and a die-cut or rectangular plate with a mercury thermometer mounted on it. Round thermometers tend to be about 12″ in diameter, rectangular thermometers vary from small 3″ wide by 8″ tall models to behemoths that are as large as 6 feet tall. 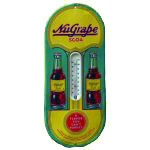 Values are highly based on condition, thermometers need to have the original face or sign in good condition with a working and intact thermometer. 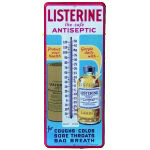 Value is also based on size of the thermometer and the subject matter / brand. 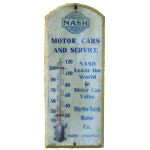 For help determining the value of your old, vintage or antique thermometer please contact us.